Yup, this past weekend saw a trail dog scrap of note going off along the Outeniqua Trail system, traversing those imposing peaks above the #GardenRoute city of George. It’s not often that an inaugural event draws nearly 300x runners, with quite a few of them flying in from all around the country, nogal. But that’s the George Mountain Ultra Trail for you, and it was obvious from the word go that organisers EcoBound Mountain Events had pulled out all the stops in putting together their first official #trailrun event. Last runners in and all smiles! Runners push through to the Tonnelbos section! Zane Schmahl and Jacques Mouton headed up an incredible team, and together they made 100% sure that the #GeorgeMUT delivered on every level possible … superb scenery, great organisation, lekker T-shirts, excellent #beer sponsor, endless views and a pretty kickass field of athletes. #DieOom himself got to spend a LOT of time on the #trail, and I have to say that I discovered a few spots in the #Outeniqua Mountains that I had no idea even existed. Of these, #Tonnelbos has got to top the list, with clear mountain streams, ancient deciduous montane #forest, tree ferns up to 5m high, and #singletrack that keeps on going for ever. 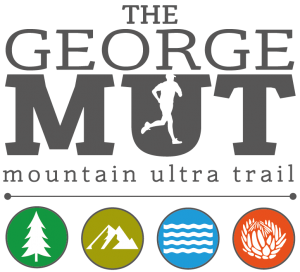 Beyond the forests, runners free-ranged onto grassland mountain plateaus, pine plantation paths, alpine ridge lines, fynbos tracks, rock-hopping descents … One thing is for sure, the #GeorgeMUT is the perfect race to go and lose (and therefore find) yourself in these dramatic ranges. But one thing is for sure: do not under-estimate the snarl and gnarl of this particular #ScruffyDog. The 25km left many a wounded leg, while a good few of the 60km competitors barely survived this canine face-off. Roelof Mostert caned it home in 6h 21min, with Megan Skowno claiming her win in 8h 23min. All in all, this rated as one of the top trailruns I’ve shot in SA, and I can only see the George Mountain Ultra Trailgrowing from strenth to strength. You can expect at least double the field next year, and no doubt the ‘Lumberjack Carnival’ Vibe will be even better!